Times are changing. Are we going through a revolution in culinary culture? Those were the days people hardly know about idly and dosa. I heard my grandma telling that they prepare idly and dosa only during festival time since they need to buy rice from outside. This means they used to have only foods that were prepared from ingredients grown at their farms. Only 2 decades ago they started eating rice and now we have a come a long way where pizza, pasta, salads rule the table. Now of late, we are seeing a change as people started going back to old ways. Nowadays people have started giving importance to both health and taste. They have taken a keen interest on recipes from bygone era..
Not sure whether all people like whole grians. But atleast many might have tried and tasted ragi. Since it is easily available in most of the shopping outlets, people have started including it in their day-to-day diet. 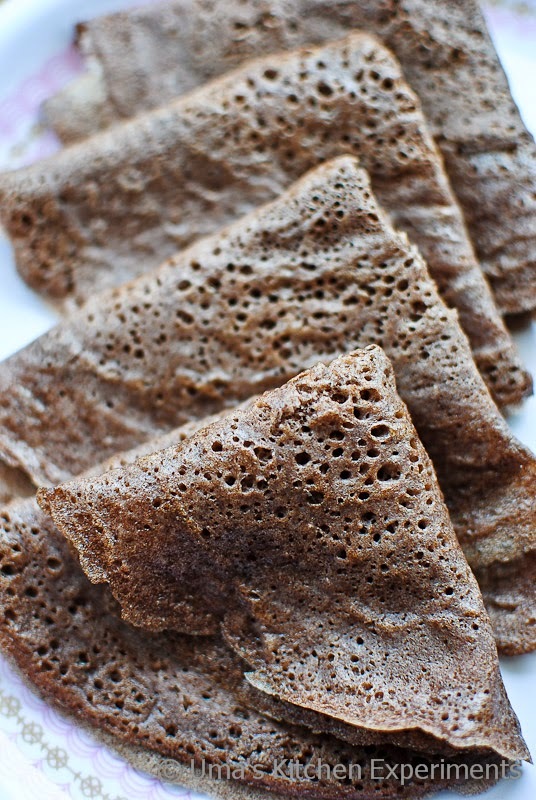 In our family, we have started preparing dosa and many more recipes using using whole ragi or ragi flour. 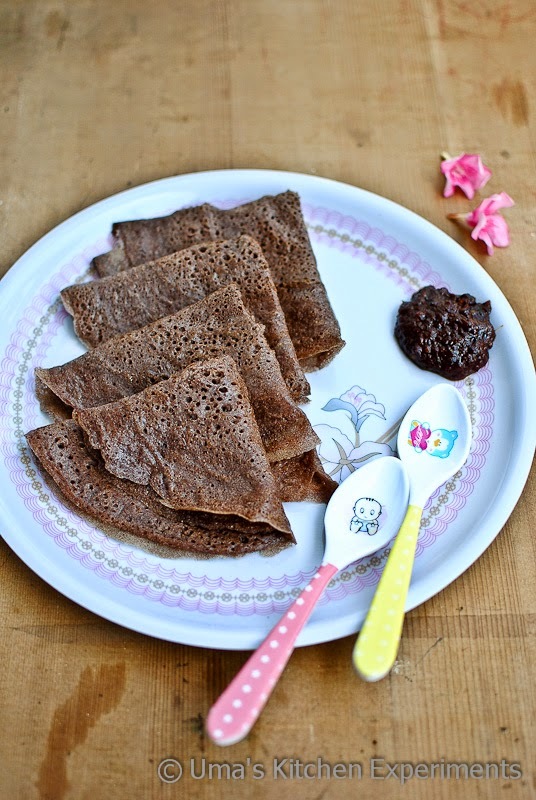 The procedure for making the ragi dosa using whole ragi is same as that of my cholda dosa. 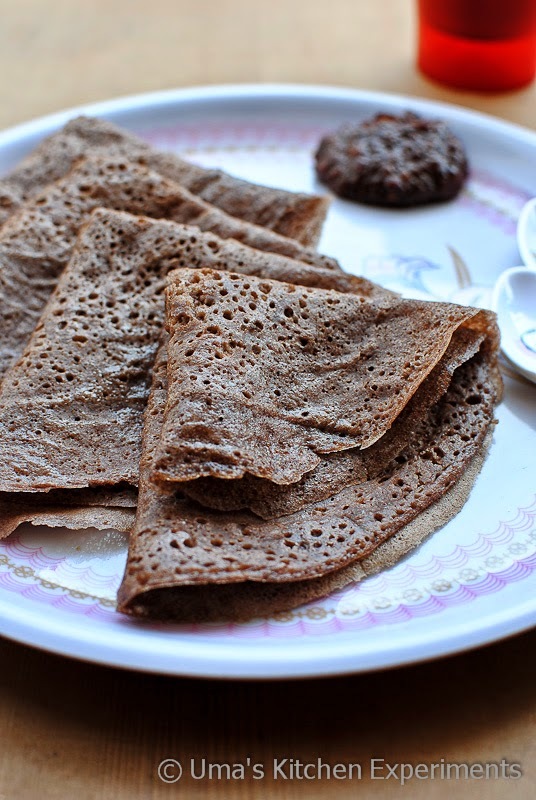 Over here, I wanted to show the method which we follow for making dosa using ragi flour but not the instant version. 1) Soak urad dal and fenugreek seeds for 1 hour. 2) After 1 hour, grind it to a smooth paste by adding necessary water. 3) Meanwhile, mix 2 cups of water and make a paste of ragi flour. Make sure there are no lumps. No need to worry about the consistency. It can be thick but not very thin. 4) Once the urad dal is ground and becomes fluffy, pour ragi flour mixture to it. 5) Continue grinding it for few minutes, until the ragi mixes well with urad dal. 6) Add salt towards the end of grinding and it ensure mixes well with the batter. 7) Collect the batter to a container. Add water if required to bring it to dosa batter consistency. Keep it in a warm place for fermentation. 8) Let it ferment for 6- 8 hours or overnight. 9) The next day, beat the batter slightly. 10) Heat a dosa pan / tawa. Pour a ladle ful of batter to the centre of the pan and spread it towards end in a circular motion. 11) Drizzle some oil and wait for the dosa to cook. 12) After few minutes, flip to the other side to cook other side. 13) When both the sides are cooked well, transfer to a plate and serve hot. 14) Any hot / spicy chutney goes well with this dosa but we always make tamarind chutney(you can see it in the picture) to accompany it. I will post the recipe of it soon. 1) Urad dal quantity might vary based on its quality. For 4 cups 1 cup would normally go well. But the urad dal I use gives more fluffy batter when I grind. So I added only 3/ 4 cup. 2) Make sure the batter is in right consistency. It should not be very thick or very thin. I have never tried like this. I am trying it soon!!! Lovely pictures. 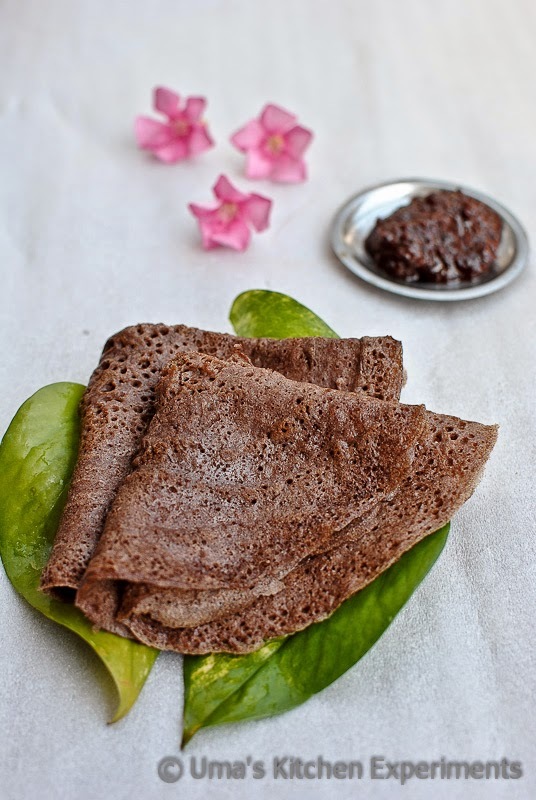 i like tis method.. will try nxt time..
Ragi dosa with coconut chutney, yumm my favourite.